A Football Diaper Cake to Cheer Over! It's the Gators vs. the Bulldogs with this adorable football diaper cake! 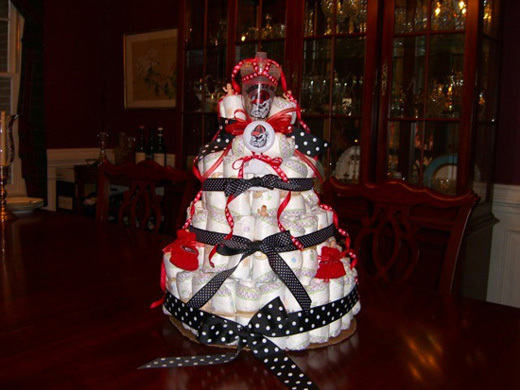 Katherine submitted this fun & festive UGA - Florida Football Game diaper cake and also a darling girl diaper cake. There is plenty of Bulldog and plenty of pink in these 2 baby shower cakes. This is such a fun idea to hold a couples baby shower at the same time as a football game, so the expectant father and his friends can enjoy the game, while the expectant mother and her friends talk about all things baby. 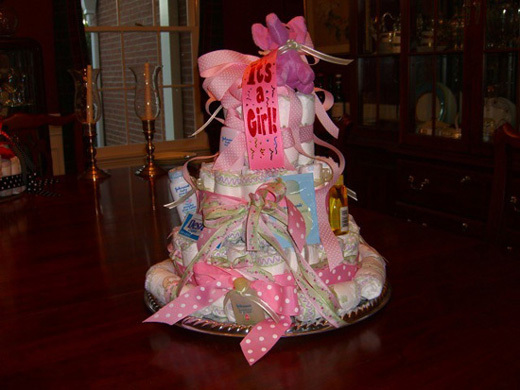 We really appreciate Katherine for submitting these two beautiful diaper cakes and for making this website a more useful and more helpful resource to help others with creative diaper cake ideas. She describes how she made her Bulldog and Baby Cakes. Thanks for Paying it Forward, Katherine!! 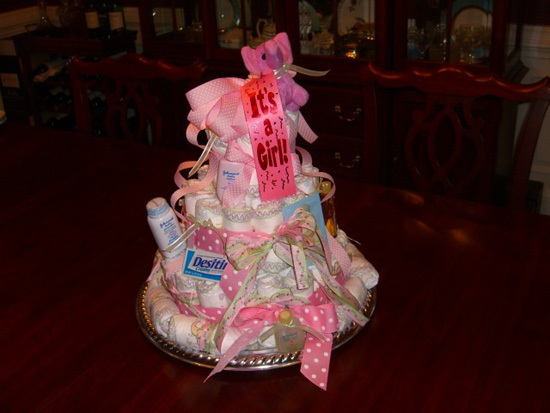 If you have a diaper cake that you would like to share, submit it here! We made 2 cakes since the shower was held during the UGA - Florida football game. One for the ladies and one for the guys (like they cared). Also we purchased the diapers at a bulk warehouse store so we had enough for at least 2 cakes. The UGA cake was set on a circular card board cut out from the diaper box. The "baby" cake was built on a plastic sliver colored serving tray from party store. The top focal point of the UGA cake was a UGA sippy cup and the "baby" cake had an elephant (the dad's favorite). On the UGA cake we added UGA baby items and on the "baby" cake we used travel sized baby items. Everyone loved the cakes and they will now be a tradition at all the future showers. We have set the bar! Thanks Katherine!! I'm sure these cakes made the UGA - Florida game and the baby shower an event to remember! 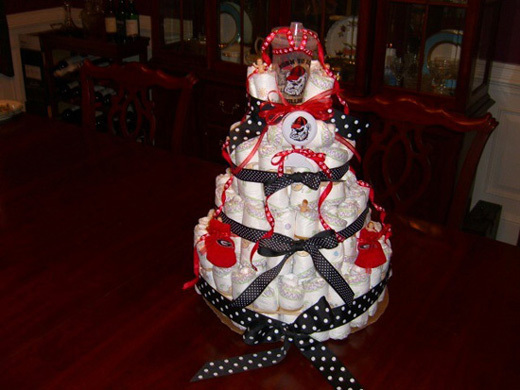 If you liked this football diaper cake, learn how to make your own diaper cake, right here !